Your cruise ship has just sailed into one of Edinburgh, Scotland's four ports, and you're eager to disembark for a day of exploring. Or, you've arrived for a vacation in Edinburgh via plane or car and you're looking for attractions to visit. Edinburgh is ripe with popular historical sights, but I discovered that if you prefer to skip the usual tourist spots in favor of the offbeat or lesser known, and you don't want to venture far from the cruise ports and the city's center, there are plenty of excursions that are "different" --- entertainingly out of the ordinary -- on Edinburgh's outskirts. Follow my lead. 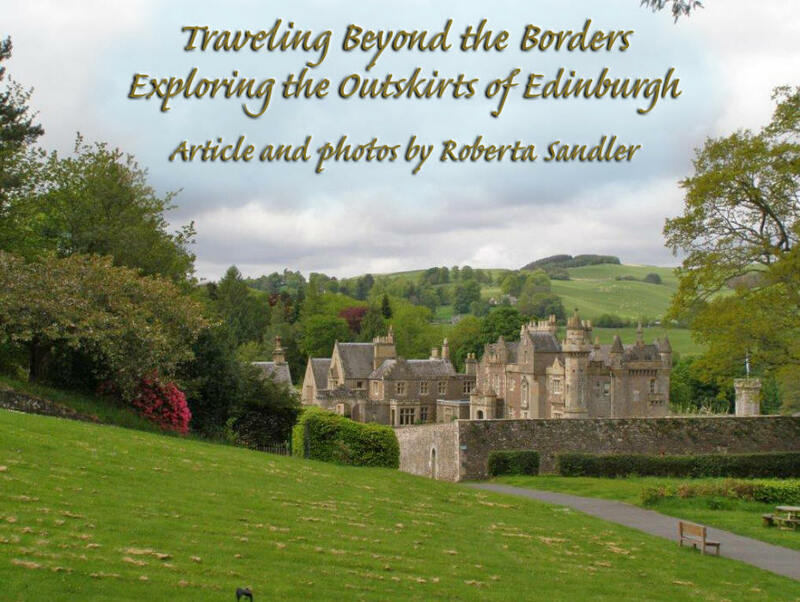 On my recent visit to Edinburgh, I curiously headed for the Scottish Borders, the region surrounding Edinburgh and consisting of what began as villages or marketplace towns, some of which date to the 12th century. They are eye candy for history or architecture buffs. As a fan of the TV series "Outlander," I was especially happy to visit sites where scenes from "Outlander" were/are filmed. My hotel, Cringletie House, located in the market town of Peebles on the river Tweed in the Scottish countryside, was formerly a baronial castle. Today, it is a boutique hotel-with-restaurant offering 14 cozy guestrooms with spacious modern bathrooms. This hotel extended superb hospitality. It wasn't merely a hotel stay. It was an experience. In the evening, I and other guests assembled at the hotel's rear property, where Cringletie House had arranged for a nearby sheep farmer to bring his border collies and some of his sheep. What followed was a delightful demonstration of sheep-herding. The following morning, Rachel Hammerton, director of the Border Kilt School, showed guests the mathematically detailed, intricate art of kilt-making. Kudos to Cringletie House for providing entertainment like this to guests. 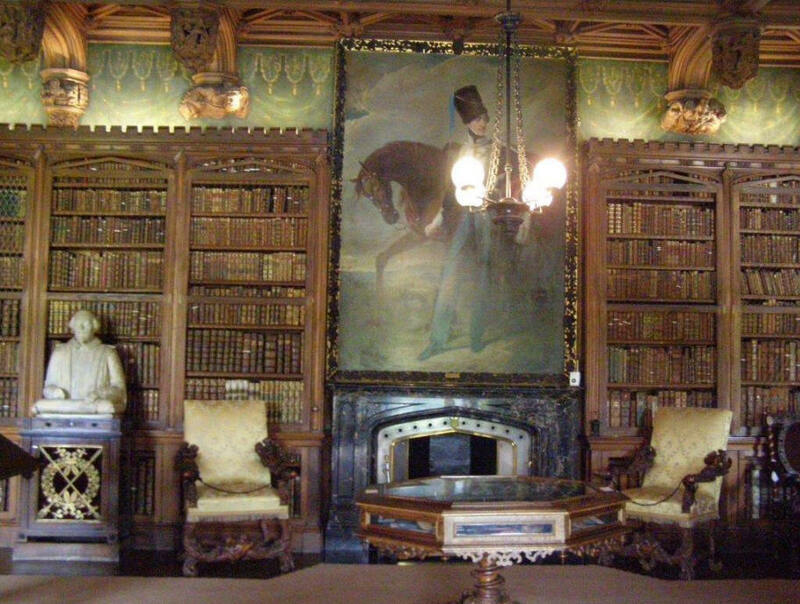 Abbotsford's book-stacked library, including one-of-a-kind works; the costly furnishings, Scott's sword collection; and Abbotsford's gardens all reflect Scott's literary success. Linlithgow, located in West Lothian, is about 20 miles from Edinburgh, and is home to Linlithgow Palace, the birthplace of King James V and his daughter, Mary, Queen of Scots. The entrance and corridors served as Wentworth Prison in Outlander scenes. Construction of Linlithgow Palace began in 1424. Small window openings now dot the lonely ruins of the roofless palace, like holes in a fort bombarded by cannon fire. Yet, as I wandered through rooms and corridors, I sensed a grandeur that once existed here. That grandeur survives in the central courtyard's elaborately-carved, tiered fountain that King James V built in 1538. Legend says that wine flowed from the fountain. In spite of its storied past, the burgh of Linlithgow gives a nod to the future by going where no man has gone before. A plaque was installed in Linlithgow in 2007 to commemorate Scotty, the fictional chief engineer of the "Star Trek" starship, Enterprise. You see, Scotty was born in Linlithgow in the year 2,222. Culross Palace and Village in Fife is located about twenty miles from Edinburgh. In its thousand-year history, Culross has been a religious center, a market town, a Royal Burgh and a center for coalmining, salt-mining and the making of "girdles" (griddles), which 14th-century Scottish king, Robert the Bruce, ordered for his soldiers so that out in the field, they could eat their oatcakes roasted rather than cold. Culross is so charmingly quaint that I thought I had wandered into Brigadoon. It's a sloping town with small, red-roofed houses, many of them built in the 1600s and still used as private homes. The Town House (meeting hall) had a Witch's Jail. In 1597, Robert the Bruce's descendant, Sir George Bruce, a successful merchant, built a house here. A successive owner dubbed it Culross Palace. 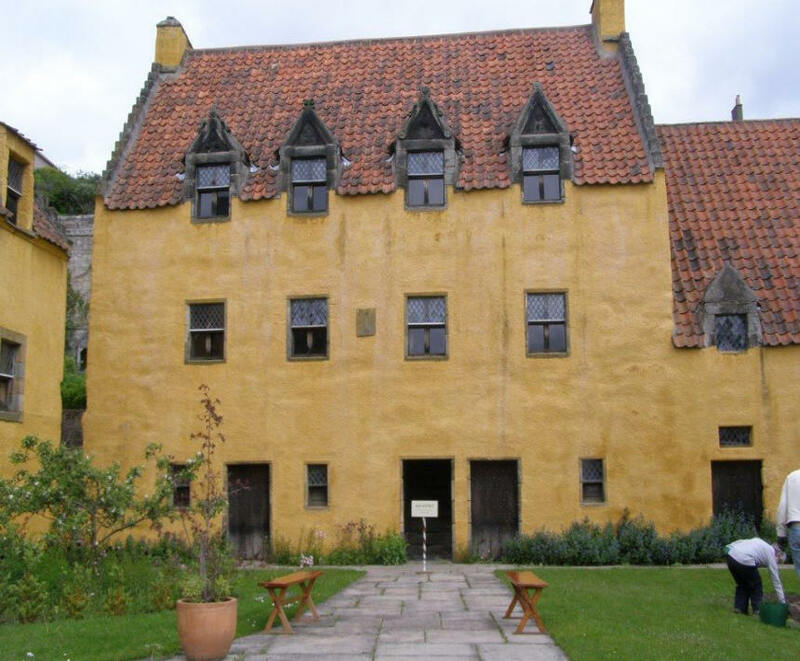 The National Trust for Scotland bought Culross Palace, beautifully restored it and opened it for tours. The tour gave me good insight into the lifestyle of a prosperous Scottish gentleman during the 1600s. Paint was costly. Sir George painted his house (ochre), a symbol of status. His property included a garden, another status symbol. In a scene from Outlander, Claire, a healer (nurse), picked medicinal herbs from the garden. When a house has a High Hall for dining, a Principal Stranger's Room for a visiting important guest; a stone strong-room for protecting money; a four-poster bed with a moveable panel that lets out body odor and lets in fresh air; and a kitchen with a water supply that extends into the home's bakery, it's not hard to deduce that the owner is rich. Emma Chalmers, whose company, Mary's Meanders, conducts guided historic tours, told me that she has loved going to Culross even before it was used in Outlander. "It gives you a real glimpse into how people lived in the 16th and 17th centuries," she says. "Plus, the Sticky Toffee Pudding in the Red Lion Inn in Culross is worth traveling to." When I visited Dunfermline, a lively town located in Fife, 30 minutes from Edinburgh. 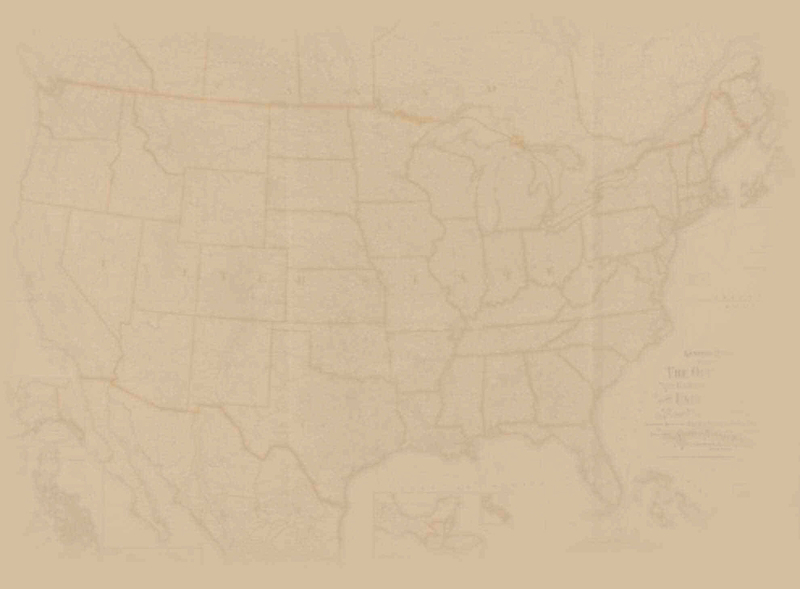 I found it pulsating with attractions, including the Andrew Carnegie Birthplace Museum, the world's first Carnegie Library and (New Yorkers, take note!) a Carnegie Hall. For lunch, I enjoyed The Bruery, a rustic pub on Canmore Street. It has a menu of simple, tasty foods and it operates a micro-brewery on the lower level. Here, too, is the beautiful Abbey Church of Dunfermline. The Abbey was founded in the eleventh century. 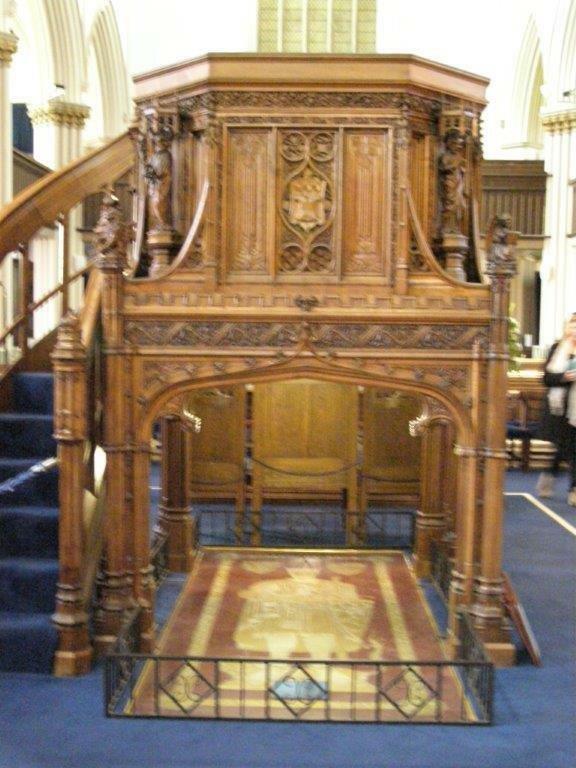 Several kings and queens are buried here, including Robert the Bruce, who reigned from 1306-1329. Beneath the pulpit, his body rests inside a brass-covered tomb. His heart is buried at Melrose Abbey. 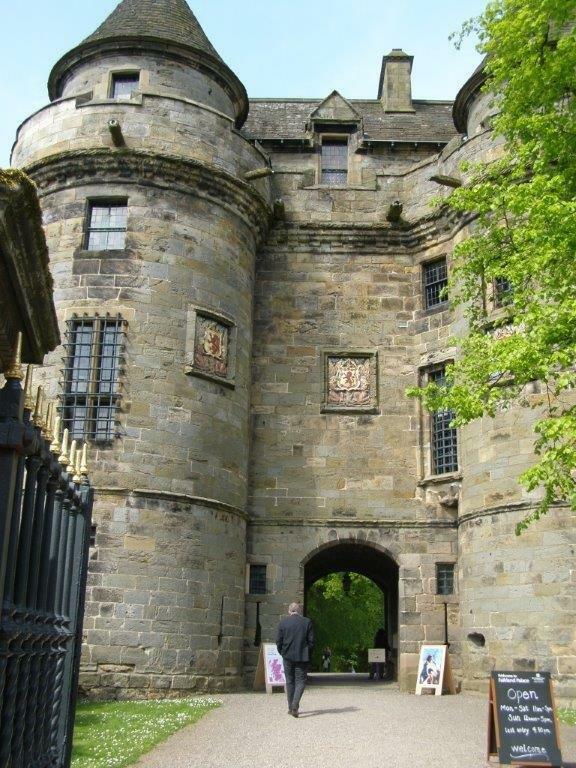 Falkland Palace and Garden, also in Fife, was built by King James IV and King James V between 1450 and 1541. Now under the care of the National Trust for Scotland, the Renaissance-style palace -- it was used as a hunting lodge -- is magnificent. I was awed by its history, exquisite furnishings and wall tapestries, and its vibrant garden of flowers and beech and maple trees that seemed to be colored by an entire box of crayons. The palace's east range is a ruin, but what survives stands tall and strong, and what may be most notable about the palace is the extant Royal Tennis Court built in 1539 for King James V. The roofless court has four walls (the ball was allowed to hit the walls). When it was the king's turn, a servant would serve or hit the ball to the king, who would then hit it over the net, toward a player. That reportedly is how the tennis term "serve" began. 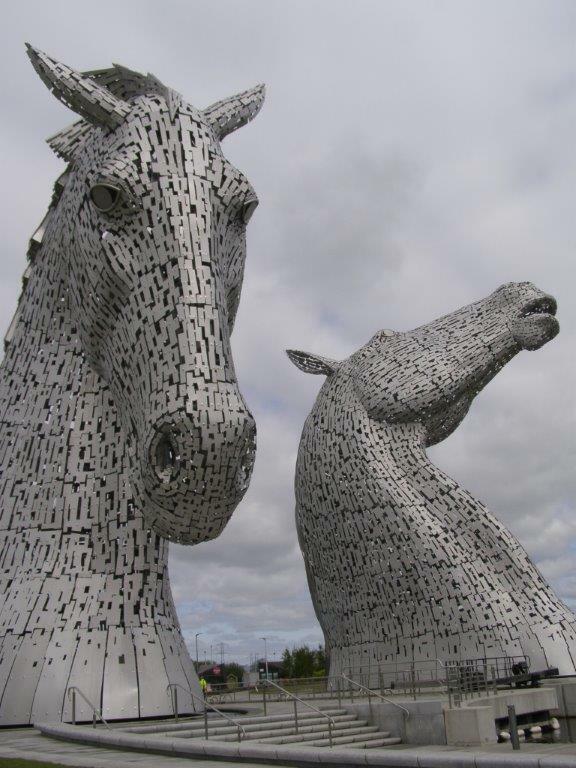 Falkirk, about 20 minutes from Edinburgh, is home to The Kelpies, two horse heads, each made from 18,000 pieces of steel. Lighted at night, the stunning 100-feet-tall Kelpies, each weighing 300 tons and touted as the world's tallest equine sculptures, resemble sea creatures rising from the Forth and Clyde Canal. A guided tour led me inside the head of the horse titled "Head Down." There, I watched sunlight dart between its 464 steel plates. Tourist-wise, the best hands-on excursion I've experienced is my brief cooking lesson from a chef, Jenny Thomson, who conducts Courses for Cooks. 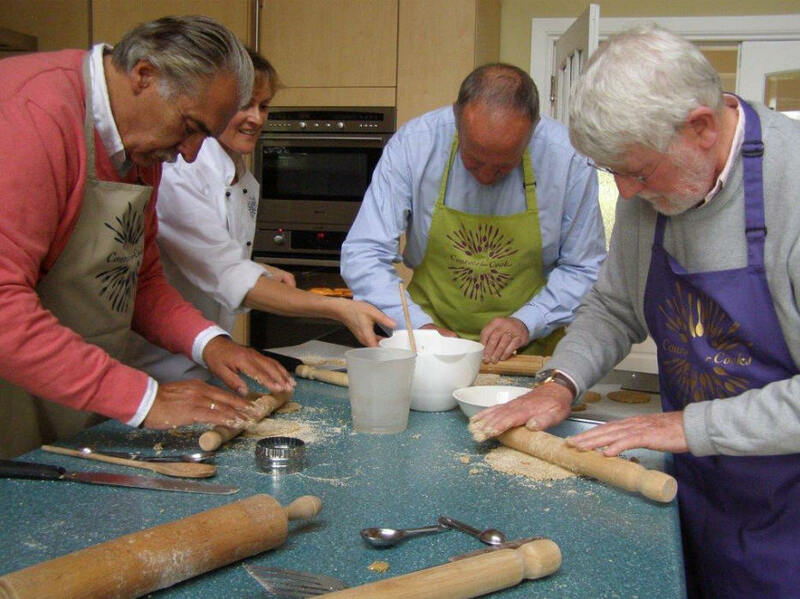 At her Victorian Manse in Fife, I and three male participants followed Jenny's simple directions to make oatmeal cakes. We made oatmeal batter, rolled it, flattened it with a rolling pin, stamped it with a cookie cutter, placed it on a baking sheet that Jenny slid into her oven, and Presto! Jenny conducts Outlander-inspired cookery courses, meals common in 18th-century Scotland. Her 2-4 hour courses range from making perfect puddings to making vegetarian feasts. Participants get to eat what they cook. Jenny uses herbs from her garden. Her classes usually are for four people maximum. I laughed a lot. Jenny made it fun. This was definitely offbeat, an ideal excursion for a husband and wife and everyone else. Shopping was not on my agenda, but in Leith, 15 minutes from Edinburgh's city centre, I stepped inside the Kinloch Anderson shop to browse. Beyond the racks and displays of kilts, ladies-wear and menswear that have made Kinloch Anderson the tailor and kilt-maker to HRH The Prince of Wales (Prince Charles), HM The Queen and HRH the Duke of Edinburgh (Prince Phillip), I came upon the Kinloch Anderson Heritage Room. It was like discovering a wonderful museum. Via signage, photos and clothing displayed behind glass, the history and expansion of Kinloch Anderson unfurls, beginning with William Anderson, who founded the company in 1868; the six generations continuing the long-running company; the link to the Royal family; the company's tartan designs, etc. Through the Heritage Room's viewing window, I observed an employee sewing a kilt. Travelers with days to sightsee can visit many of these tourist spots on the outskirts of Edinburgh, but cruise passengers with limited time can still make choices among these memorable excursions. As I discovered, these attractions are too enlightening to ignore. Some of my sightseeing was made easy, thanks to Clan Mackenzie Routes, a tour company with a personable, knowledgeable van driver-guide for a maximum of six people. Pickup and drop-off in Edinburgh.